(U) Universal, suitable for all. Disney animated comedy featuring the music of Elvis Presley. Young orphan Lilo is an Elvis fan who lives with her sister Nani in the beautiful surroundings of Hawaii. 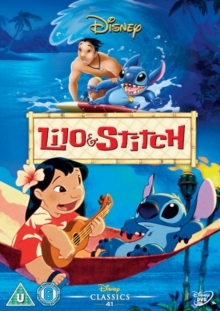 One day Lilo meets a strange alien who she decides to name Stitch and take home as her pet. Stitch at first causes trouble by destroying everything he can lay his hands on, but as time passes he becomes accustomed to the Hawaiian ways and is accepted as a regular part of the family. However, with representatives of Stitch's home planet following hot on his heels, it is unclear how long this happy situation can last.